Provide excellent customer service and work to build long-term relationships between American Spoon and our customers. Acts as an ambassador for the brand, actively educating customers and staff about who we are and what we do. Stocks shelves, both on the sales floor and in the storage area. Maintains cleanliness and organization of the store. Completes customer purchases at the point of sale. Assists Management in all aspects of the operation of our Harbor Springs retail store. 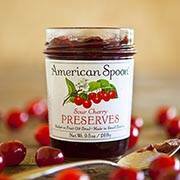 American Spoon is an artisanal fruit-preserving company located in Petoskey Michigan. Founded in 1982, we craft fruit preserves, condiments, and sauces in small batches using primarily locally sourced fruits. We are a hands-on family business with five retail stores located in some of Michigan’s most popular resort towns. At American Spoon, one of our important assets is great people. We are looking for creative thinkers and doers with positive attitudes, who have a passion for great food and enjoy working in a positive environment. One year retail or customer service experience preferred. Positive attitude and genuine, friendly demeanor. Energetic spirit and desire to work as part of a team. Must have high standards and an unwillingness to compromise on quality. Passion for food is a must and strong interest in and knowledge of locally grown fruits and vegetables. Should have Basic Mac or PC skills and a proficiency with word processing and point-of-sale systems. Some lifting involved of our case products about 18-20 pounds and will work on your feet all day. This can be a very fast paced environment throughout the day. This position involves working as team, scheduling and sharing weekend hours as well as week day hours. Will train in our Petoskey Retail Store. High School Diploma or equivalent. Some secondary education preferred. This is a great opportunity for retirees, students and teachers to work a part-time year around position in Beautiful Harbor Springs Michigan. Live and work in paradise! 1 year retail sales or Customer Service experience preferred. Send resume and background information to hr@spoon.com. Please include your email and telephone number on your submissions.